To marinate the feta: Cube feta in 1/2 -inch squares and place in mixing bowl. Pour olive oil over feta. Add basil, season with pepper; gently toss and set aside. 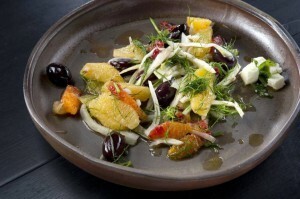 To make the salad: Place sliced fennel, chopped fronds and olives in a large mixing bowl. Place a navel orange on a cutting board; slice off both ends, then using a sharp knife, peel the rind away from the flesh of the fruit following the contours, removing the pith or white part with the skin. Using a paring knife, segment the orange by removing the flesh from the membrane. Place in the mixing bowl; repeat the process with 6 more navels and all the blood oranges. Juice one navel orange. In a small bowl, whisk together orange juice, olive oil, red wine vinegar, honey, salt and pepper. Drizzle dressing over salad, tossing gently to combine. This salad can be made in advance and tossed before serving. Serve at room temperature or chilled. To serve: Place salad in a serving bowl. Serve marinated feta in a small serving bowl alongside the orange salad. Per serving, based on 8: 503 calories (65 percent from fat), 38 grams total fat (12 grams saturated), 51 milligrams cholesterol, 35 grams carbohydrates, 11 grams protein, 963 milligrams sodium, 11 grams dietary fiber. This entry was posted in Chalkidiki Olives, Health-Nutrition, Inolivia olives, Recipes and tagged olives, orange, salad, thanksgiving. Bookmark the permalink.